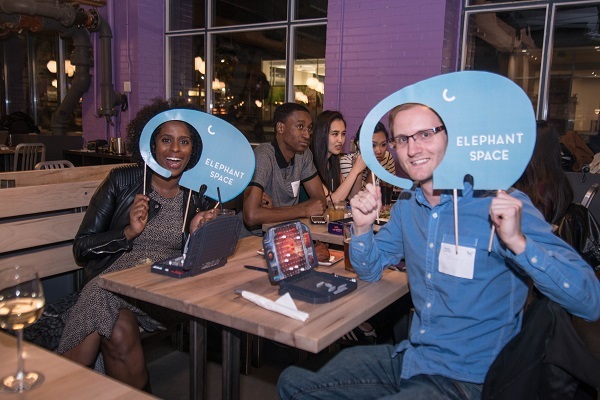 Recently incorporated as a non-profit, Elephant Space hosted a board game mixer as its launch party fundraiser at Snakes & Lattes – 489 College Street. Guests were invited to come out, roll-the-dice, and “get their game on” in support of funding Elephant Space’s new after-school initiative. “We are incredibly excited to be celebrating Elephant Space’s launch party fundraiser in North America’s first board game cafe,” said Milan Seki, executive director, Elephant Space. “I was inspired to create Elephant Space through the social gaming offered here so it’s quite serendipitous to come and celebrate this organizational milestone here.” Milan attended George Brown College, is a startGBC entrepreneur and took part in the 2016 Applied Research Day Pitch Competition. Elephant Space received its non-profit status in September 2016 and debuts its after-school programming on November 11th, 2016 in a donated space offered by Community Corner (community hub) in St. Jamestown. Youth can drop-in for programming from 3:30 to 7:30pm at 200 Wellesley Street East. Elephant Space provides a safe supervised space for youth to relax, play board games, have mentorship opportunities, receive homework help and attend meaningful life skills workshops. Elephant Space was founded in May, 2016. A truly millennial labour of love, the idea grew from a grassroots initiative by using the platform of bunz employment and entrepreneurial zone. Elephant Space, non-profit #989993-6, provides a safe support space where youth, between the ages of 12-14, are able to relax, receive counselling, and gain valuable tools to navigate the world. With an emphasis on learning through play, Elephant space promotes communication, empathy and teamwork through board games, homework assistance, engage in workshops and mentorship development programs. This after-school program space is supervised by supportive and trained youth coaches, who can provide guidance and foster personal growth. Elephant Space programming takes a preventative approach toward issues such as: bullying, suicide, and isolation.